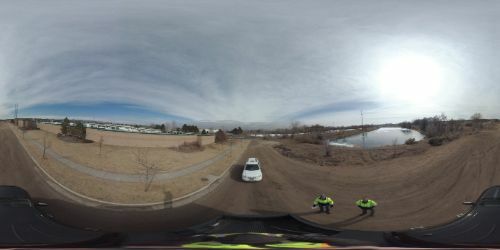 Get a 360-degree view of the Sharp Point And Nancy Gray Connection Project site. Check out the new Frequently Asked Questions for the Sharp Point and Nancy Gray Connection Project. The City Master Street Plan identifies Sharp Point Drive and Nancy Gray Avenue connected across the Great Western Railroad tracks. In recent years, the connection has become a priority due to recent developments to the south. Emergency services including Fort Collins Police and the Larimer County Sheriff’s Office are located very close to this project, and will benefit greatly from having multiple ways to access neighborhoods and businesses. The City submitted an application for a new at-grade crossing of the Great Western tracks to the Public Utilities Commission (PUC). Due to Great Western Railroad opposition of the new crossing, the application went through a hearing process with the PUC. City Staff negotiated and executed a settlement agreement with Great Western. The PUC approved the crossing application in late 2018. 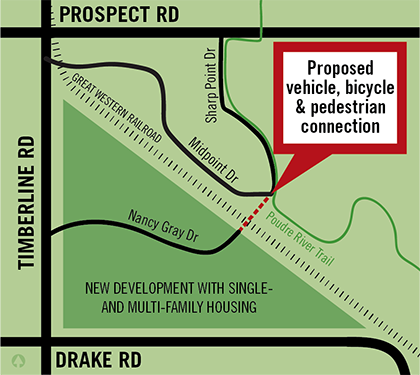 The project will also provide a bike and pedestrian connection to the Poudre Trail north of the railroad tracks. The City has hired a construction contractor who will begin construction the week of April 15, 2019. Construction is anticipated to last approximately 90 days, depending on weather and other unforeseen circumstances. City staff are working with the Federal Railroad Administration, Public Utilities Commission, and Great Western Railroad to pursue establishing a quiet zone at the crossing. Transportation Capital Expansion Fee (formerly Street Oversizing) funds are the primary funding source. Additional funds were appropriated as part of the City’s 2017-2018 and 2019-2020 budgets.